O, Glory, take us higher! O, Love, save us from ourselves, cry, cry, the lonesome wolves in the hills above the small town of Krasnodar, Russia. Georgy Kuznetsov and Andrey Blokhin share this same spirit in their artist collective of two, Recycle Group. Hungry for meaning, bred in Classical Art, these two young men display maturity in their understanding of Creation and an earnest elucidation of This Modern World. 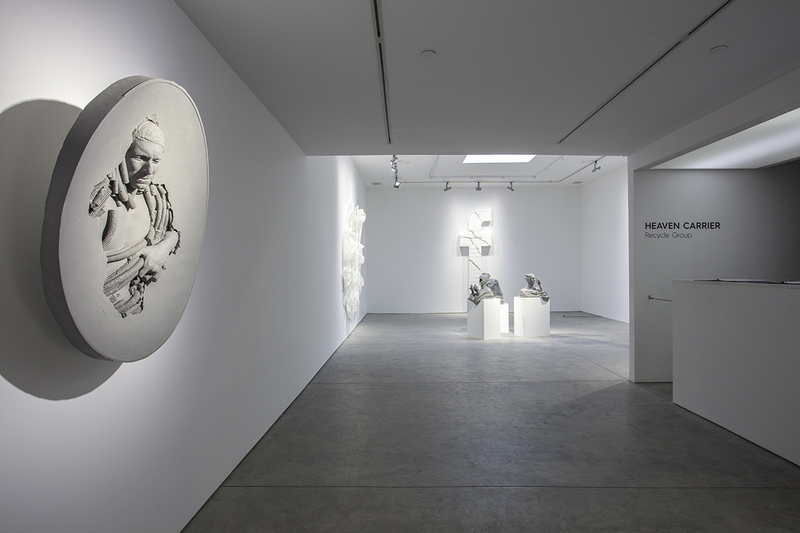 Their current exhibition at the Richard Taittinger Gallery in the Lower East Side is nothing short of its name, Heaven Carrier: That which carries us to the paradise of our longing,that which connects us in the inextricable web of life to all other things, living and not, material and not. These connectors that have changed their attire over the ages have kept true the same underlying principle, sharing the message of Life. Sharing truth, sharing knowledge, sharing desire, sharing hope, sharing despair, sharing the experience that joins us in the tapestry that we are all connected through. Today, we see the fashion show parading pseudo tangible links of the Social Network; where people share their every waking breath it seems in describing things they have done, what they ate, and whom they had that drink with at that cool club. Their faith in activity displaying their distrust of stillness, their unfamiliarity with the Spirit is what moves lips to say empty words. Yet, this is where they rest their weary heads in the sure foundation that someone out there cares what they think. The ubiquitous religion of the masses, non denominational in the sense that it is not barred by social, cultural, economic, or religious background, the perfect shape-shifter that provides fit structure everyone loves to fill with their own content. The Social Network, carrier of dreams, Heaven Carrier. Andrey and Georgy say jokingly that they were forced into art, both the sons of classical painters, the painters themselves friends, and the boys growing up deeply involved in the process. They spent their time as children in the studio, at their fathers’ residencies, mixing paints, imbued in the classical nature and practice of Art. Growing in the shaded light of the Classical and Renaissance belief that a man has within his hands the power to fashion his destiny and mold the world in which he lives by creating the imagery that represents both his life and his environment, the two respectively found themselves with a primary instinct to create that which they see; said seeing being beyond the thing itself and into the essence of the meaning. The Japanese call it Kensho. “Our inspiration is the whole world, I think, and people, nature,” Georgy says, “Everything in life,” Andrey interjects. They are products of their environment and the conditions to which they found themselves in as young men in Russia has translated to a globally recognized statement of truth in regards to the Contemporary Human Experience. Everyone can see the force Facebook has become in its mere 11 years of existence, garnering over 1.23 billion users (thenextweb.com), encroaching like a Tsunami on Christianity that over 2,000 years has built a 2.18 billion (pewforum.org) clergy member base. Revolutions have started on Facebook, just as the Crusades and the Inquisition were instigated by the Church. If you look at the user pages of Facebook you get a real time feel for the culture of its society just as when you look upon the paintings hung in the halls of Medieval churches you see the weave of their social network.The F-cross makes the perfect raison d’etre to display the 21st Century guiding symbolism. Recycle is showing the new idols: The Wayfarer bumbling aimlessly over and over, made of white plastic mesh, white robe in flowing folds fixed atop an iRobot, cleaning the way for what to come in his path? Will there be anything of substance left after this generation raised on advertising and hollow consumption has their way with the world? Is it the gospel the Network Searchers seek as they raise their devices to the sky? “How could you or I imagine a world without each other as Facebook friends?” the acrylic, plastic and L.E.D Haloed Adam and Eve asked each of the other silently as the incarceration of spirit, trapped in a synthetic medium, capitulated to the ardent lust of instant gratification. Georgy says, “We work with visual art and that’s why it is important to find good symbiosis between material and idea. We work with a lot with experiments, we make a lot of experiments in our studio, try[ing] to find some… new technology, …I think it is very important to work with new technology because technology is like [the] second language of artists, like a second tool.” It is the technology and selected mediums chosen for use that allows them to communicate comprehensively. When you see the bust of Laocoon in polyurethane rubber, there is an immediate connection with the pain that every human is capable of suffering, and because we are now so familiar with plastic, much more so than marble, there is another level symbiotic association that cuts deeply to the contemporary psyche. In Neoillusion, the artist understands the essence and meaning of each medium used, of each color chosen, of each movement taken as having a direct relation to the subject to which is being created. It is the Neoillusionist artist that sees the nature of the material as inseparable to the nature of the work of art. “You need to know the material, you need to feel it,” says Andrey, because how can you intelligibly go about representing something if you don’t have a relationship of understanding with that which brings about its manifestation? Georgy mused, “In the past to be artist, you had to know how to mix the colors, how to prepare a canvas, and all of these things. But now if you want to be an artist in our time, I think if you use some new idea from our time, if you want to speak about our time you must use new technology.” The material “must be close to [the] idea” says Andrey as he points to the plastic mesh. Mesh is a series of intercrossing points that create a networked plane that Recycle Group has used to form many of the figures they display seeking for the connection on the Social Network. The micro is the macro, the macro, the micro. When asked if their name has come to mean something beyond the name of their first show eight years ago after which people started to call them Recycle rather than their individual names, Andrey tells me “For us, Recycle is like process of changes, that something can change to another shape… We are working with recyclable materials and we always recycle ideas, from past to future we are mixing it together.” Georgy Kuznetsov and Andrey Blokhin see the unity in being, they understand the importance of the role of the artist and they are adding a fluent current of social commentary to the Contemporary Art rhetoric. With the affluence of classical reference, the serene acceptance of duty, Recycle Group is the haunting cry of the wolf that seeks only fulfillment of the light in the truth of the night.